Throw in the April break, prom and the build-up to AP testing and you’ve got a recipe for disaster for spring sports programs. And while Titan track head coach Laura Daniels did offer her athletes the opportunity to keep up with their training over the break, it was obvious they didn’t. 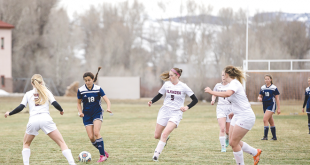 Regardless of the pain factor following the first week of practice after break, the Titans team headed to Montrose on Friday, April 28 with a full team, and then some, for the first time all season. “We had a full squad, which was awesome, and were able to run some fun relays,” says Daniels. Speaking of relays, the girls 4×400-meter relay team of Sydney Petersen, Maria O’Neal, Malia Olson and Emelie Elkins teamed up to lay down the fastest time of the season thus far to place fifth in Montrose. “The girls are within spitting distance of making it to state,” says Daniels. O’Neal went on to secure her spot at state with her effort in the 800 meters in Montrose, running in a time of 2:29.83 to finish in fifth. Meanwhile, Petersen posted a second-place finish in the mile among some heavy hitters from larger programs. On the boys’ side of things, the relay teams, Josh Merck and Tate Young all continue to gain strides across the board. Young, Woody Martineau, Sully Marshall and Finn Wilson shattered their previous personal record (PR) in the 4×800 meters to finish seventh and are currently ranked 10th in the state among 2A schools. The boys 4×400-meter relay team is within a second of getting the call to the big show and Martineau set a new PR in the 800 meters. Merck is making a name for the Titans in the sprint events as well. Merck finished third in the 100 meters and ninth in the 200 meters, setting new PRs in both, while Joe Coburn has made it to a qualifying mark in the mile, placing seventh in Montrose. “He’s 18th in the state and they take the top 18 so he just needs to step it up a little more to make sure he’s in,” says Daniels. Overall, Daniels felt the team was on point athletically in Montrose and after wrangling them through the meet to make their starts, she was pleased with the end results. The team will now divide and conquer this weekend as AP testing has athletes scattered. 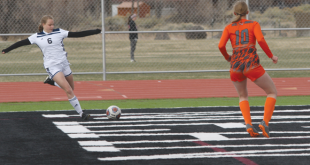 Most of the team is headed to Cañon City for the Blossom Invitational on Friday, May 5, while five Titans will head to Pueblo that evening after AP tests to run under the lights at the Twilight Invitational.